In recent interviews promoting his memoirs, Kerry confirmed he has met several times with Foreign Minister Javad Zarif – his interlocutor during the negotiations that produced the nuclear deal in 2015 – although he also indicated he has not done so since Trump withdrew from the agreement last May. 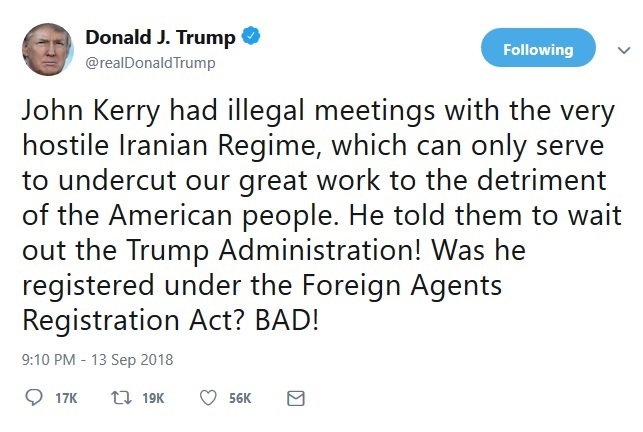 “John Kerry had illegal meetings with the very hostile Iranian Regime, which can only serve to undercut our great work to the detriment of the American people,” the president tweeted. On Wednesday, Fox News’s Dana Perino asked Kerry about the Zarif meetings, and about claims that he has been telling the Iranians to “wait out” Trump. He stressed that he had met with the Iranians before Trump pulled out of the Joint Comprehensive Plan of Action (JCPOA) nuclear deal. Kerry said every former secretary of state meets with foreign officials, attends security conferences, and has conversations. Earlier, Kerry told conservative radio talk show host Hugh Hewitt he had met with Zarif “three or four times,” and made reference to “a conference in Norway,” “a conference in Munich” and the World Economic Forum. Asked whether the intention was to “coach him through the Trump administration’s rejection of the JCPOA?” Kerry said that was not his job. He said the U.S. historically did not have a good record when it came to regime change strategies, and the administration’s approach would make it difficult, if not impossible, for any Iranian leader to negotiate. Kerry also underlined again his view that Zarif and President Hassan Rouhani are moderates. Trump’s decision to withdraw from the JCPOA “fails to understand is there’s this fight going on in Iran itself for the future of the country,” he said. Kerry and Zarif both attended the Munich Security Conference in Munich, Germany on February 18 this year. On June 13-14 last year, both men attended the Oslo Forum, an annual meeting focusing on mediation of armed conflict. Kerry and Zarif were also both at the World Economic Forum in Davos on January 19, 2017, in one of Kerry’s last engagements before leaving the State Department. A fourth meeting, which Kerry did not mention to Hewitt, took place in New York last April, just weeks before Trump’s JCPOA withdrawal announcement. The Boston Globe reported on that meeting some days after it took place, prompting a sharp-worded tweet from Trump. Iran’s foreign ministry then confirmed the Zarif-Kerry meeting had taken place. The Foreign Agents Registration Act referred to in Trump’s tweet is a pre-World War II-era law requiring agents who represent the interests of a foreign power to disclose the relationship, along with financial and other information.